Both rooms have full length windows and double French doors that open out into the south facing courtyard adjoining the main house. Whilst it is set on a main road, you only have to step into the paddock to completely lose yourself in the magic of alpacas and the peace of the countryside (ducks aside!). 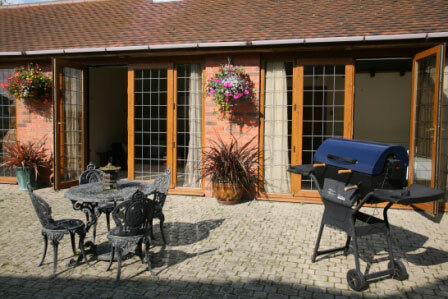 It is conveniently located for easy access to Worcester for the races, cricket, the cathedral and riverside walks. Stratford on Avon is within easy reach for everything Shakespeare. And if city life is more to your liking, Birmingham with the National Exhibition Centre, National Indoor Arena and National Sealife Centre are within an hours drive. More locally there are enough footpaths including the Wychavon Way, bridleways and nature reserves to keep the most wandering spirit happy. If that is not enough, the Cotswolds offers pretty villages and historic houses for a little more culture. The bedroom has a king sized double bed. The lounge has a bed settee which would be suitable for a child or a very good friend who you didn't mind passing through your bedroom to use the bathroom. The bathroom is en suite with pedestal basin, toilet and walk-in shower with soap and shampoo/conditioner dispensers. It has a heated towel rail for warm, fluffy towels. In continental style the bathroom also discreetly houses the washing machine. The newly fitted oak kitchen boasts electric oven, gas hob, microwave, integrated dishwasher and fridge. It has all the conveniences of home; everything you need should you choose to cook: toaster, kettle, stick blender, cafetiere, food processer etc. All cleaning materials, dishwasher tablets, washing up liquid, laundry tablets, Hoover, mop and bucket provided. It is a cosy lounge and diner with leather sofa bed settee suitable for one. There is digital TV with integrated DVD player and USB port for playing music. The bookcase provides material for a lazy day. The apartment has its own outdoor table and chairs and a barbeque is available for use stored in the end of the stable block; 1 bag of charcoal is provided. There is no particular separate garden area; visitors a free to use the footpath to the side of the paddocks to access the national footpath at the end of the farm or to exercise their dogs in the front garden. There is ample off road parking. Weekly bookings are from Friday to Friday. 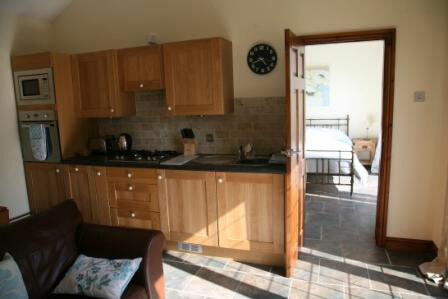 Short breaks are available from Friday to Monday, or Monday to Friday. For bookings made more than 6 weeks before arrival, a deposit of 25% of the total cost of the holiday is required. The balance is due 6 weeks before the holiday commences. For bookings less than 6 weeks before arrival, the total amount is payable on booking. Payment can be made by direct transfer, or by cash or cheque. Daily rates are available by negotiation. Changeover day is Friday with the apartment to be vacated by 1030 and will be available from 1530. A late stay may be possible, please enquire. All bedding and kitchen linen is provided. To assist us we request that at the end of the week you leave the property as you would wish to find it. The apartment is cleaned weekly. If your stay is for a fortnight or more, linen will be changed on Fridays. The property is all on one level but door sills make wheelchair access more difficult (but not impossible).